Welcome to NYC’s premier health, fitness, and wellness networking happy hour! 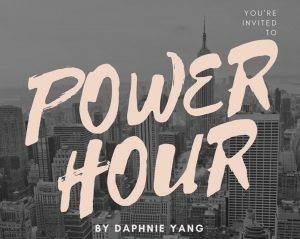 Created by Fitness Entrepreneur, Daphnie Yang, POWER HOUR brings together #girlbosses for a bi-monthly happy hour and panel discussion on all things health, fitness, wellness and what it means to be a female entrepreneur! POWER HOUR has been bringing together health, fitness, and wellness entrepreneurs and professionals since June 2017. Panelists have varied from acupuncturists, nutritionists, entrepreneurs, health coaches and so many more #girlbosses. POWER HOUR provides attendees who are passionate and interested in the health and wellness industry the opportunity to meet and network with leading women and entrepreneurs who are currently working in health, fitness, and wellness. It enables professionals from all aspects of health and fitness ecosystem to come together and emPOWER one another and build meaningful and lasting connections.